My previous post "Google gets it right" generated a bit of discussion on the relative merits of Microsoft and Google in the mapping space. I just wanted to say that I am relatively neutral on that score at the moment - I think that each has strengths relative to the other, and we are in the early stages of what will be a major battle between the two of them (and perhaps others, such as Yahoo), over the next few years. Google built up some good momentum ahead of Microsoft, first with Google Earth and then with Google Maps, and I think that their relatively recent announcement that they are indexing all KML files on the web gives them another advantage, because of their leadership in search. However, as I wrote about in GeoWorld a little while ago, Microsoft has a strong track record of being a "fast follower" and gaining market leadership after initially falling behind - as it did to Apple with Windows, and to Netscape with Internet Explorer. The most obvious area where Microsoft has a significant technical advantage over Google is in its 3D building models and the techniques and technology it acquired from Vexcel to enable it to automatically build these from accurate photogrammetric data. I don't see how Google's current approach of allowing the community to upload models will come anywhere near the accuracy or completeness of what Microsoft is doing there. It requires a major investment to match what Microsoft is doing in this area (Microsoft say they are spending hundreds of millions of dollars on this). A related area where Microsoft has an advantage also is in the "Birds Eye" oblique imagery data that it offers, which Google doesn't. I think that Microsoft seems a little more focused on pushing Virtual Earth as an application development platform in the business world, though admittedly that's subjective - and both of them really need some work on their licensing arrangements for commercial use. As discussed in the comments on my earlier post, in some areas Microsoft has better imagery than Google (such as the village of Cropston in the UK, where I am at the moment), but the reverse is true in other cases - it's hard to draw any clear conclusion there without a lot more analysis. Other related technologies of interest that Microsoft has include SQL Server Spatial (coming next year), and Photosynth, which is one of the coolest new technologies I have seen for a while, which has a lot of potential for being integrated with Virtual Earth. But having said all this, Google still seems to have the mindshare and momentum in the online hacker community, where people are developing lots of cool things, and in the blogosphere. KML has great momentum as a format for publishing geospatial data. But both companies clearly see the mapping / geospatial area as a major battleground and are investing significantly to try to get the upper hand, which can only be good for the industry. An interesting story at Technology Review (via gizmodo) on how Tele Atlas is using software and data from Inrix to better predict traffic flows, by making extensive use of historical traffic flow data. You have to hand it to Google, they do a lot of things very well. I am in the UK and was just testing my various BlackBerry 8800 mapping applications as I took a short train ride. BlackBerry Maps actually did best this time - I have found that it has a pretty nice real time tracking mode, which shows you your speed and bearing as well as a dynamically scrolling map. Telenav gave me a lat-long but never managed to download any map data, just gave a "loading" message (while great in North America, it hasn't been any use to me in the UK so far). Spot didn't manage to download a map either, MGMaps still isn't recognizing my internal GPS and Google Maps didn't support GPS when I was on the train. However, I am just waiting for someone to collect me from the station and thought I'd quickly surf the web on my BlackBerry. My home page is Google Mobile. Right there on the front page, with just a handful of other links, is a link saying "download google maps mobile with GPS support". I click on that, and have a page which says "download google maps with GPS for the BlackBerry 8800" (so it obviously recognized my device automatically). It told me that it was a 200k download in advance, so I know it wouldn't break the bank despite the fact that I'm paying by the kB here. It takes about a minute or so to download, and now I have a very nice Google Map (either a street map or a satellite image) centered on my current location, accurate to 3m. And I can blog about it while I'm still waiting to be collected! I wish that all my software installations and upgrades were that simple! (Though now I think about it, I'm a little surprised my existing Google Maps Mobile didn't tell me that there was an update available - so still room for improvement!) I'm still planning to provide more details on various new BlackBerry location applications shortly, as mentioned in previous posts. Intergraph has announced at its Intergraph 2007 conference a new capability for its GeoMedia WebMap product to be able to produce mashups with Google Maps or Microsoft Virtual Earth, without requiring any programming. This will be available in GeoMedia WebMap 6.1 later this year. I think this is potentially a very significant announcement - I have been saying for some time that the traditional GIS vendors need to leverage what Google, Microsoft et al are doing and not try to compete with it, and had been pushing this in my time at Intergraph. But it's a big culture change to do this as it starts to take these vendors down a path where they have less control in their customer base than they have done in the past. ESRI in particular seems reluctant to go down this path - they have nothing comparable to this new offering from Intergraph at the moment, it is left to third parties to provide software like Arc2Earth. This solution lets you do anything you can do with GeoMedia WebMap in terms of sophisticated visualization and server-based geospatial analysis, and overlay that in Google Maps or Microsoft Virtual Earth. The press release isn't specific on this point, but my understanding is that the GeoMedia maps can be created "on the fly", or they can be published as tiles in advance, for very high performance like that achieved with Google Maps and Virtual Earth. Intergraph has not done a great job historically in promoting the full capabilities of GeoMedia WebMap, which has had comprehensive server-based geospatial analysis and visualization capabilities since long before ESRI brought out ArcGIS Server. So I think this has great potential technically - a key question in terms of how successful it will be in the bigger scheme of things is whether Intergraph will get more creative in the way it markets and licenses GeoMedia Webmap to get greater uptake in the market. I have multiple connection challenges at the moment - am in England and only have access to a PC with dial up connection, and a slow GPRS connection on my BlackBerry (compared to EDGE back home) which I have to pay for by the kB rather than having unlimited bandwidth. So just a short update on my previous BlackBerry 8800 posts for now. I have found out that Telenav, the navigation software which I really like as I've said previously, only does road navigation in the US and Canada. At the same time I had a comment on my earlier posting which suggested I should also try Wisepilot, and they happen to offer a 5 day free trial with European data, so I'll give that a try later this week and report back. In addition to navigation capabilities, they also offer functionality which warns you when you are approaching a speed camera (in Europe) ... not that I will have any need to use that, I hasten to add, in case there are any traffic police reading this! The second piece of news is that Skylab Mobilesystems, who produce the Spot for BlackBerry software which I reviewed previously, have announced a new product called MobileTracker for BlackBerry, which creates GPS tracklogs in the background, which was one of the top things I was after. It saves these in KML so you can directly display them in Google Earth and Maps (and elsewhere). The software I have been using to geocode photos, RoboGeo, expects a GPX file as input rather than a KML file I think, so may need to mess around a little bit to overcome that, but I'm sure I can work around that. And finally for now, the technical support team at Mobile GMaps, which I also mentioned in my previous post, tell me that they have an update which they think will enable the use of the BlackBerry 8800 GPS, which didn't work for me before - again, haven't had a chance to try that yet but will do so soon. Also, I did try the "phone positioning" used by the underlying Navizon software, which uses some sort of signal triangulation, on my travels, and that did locate me in Chicago airport, though not in Calgary or in the UK. So some promising indications, will report back as I am able to try each of these out. Next week is the Intergraph 2007 show in Nashville. I won't be there, but plan to blog a little (remotely - will be in the UK in fact) about some of the interesting new things my friend Mark Doherty will be talking about in the technology keynote, which he has taken over from me. I believe that registration is looking good, and wish Mark and the rest of the gang all the best for a good conference. There have been various comments floating around about Microsoft's announcement of spatial support for SQL Server, ranging from great excitement to extreme skepticism. I have known about this for a while under NDA, and I think it is an important step for the industry. While Oracle Spatial has been out for 12 years so Microsoft has quite a bit of catching up to do, many of the recent Oracle developments have been focused beyond pure "spatial database" functionality, and more into functionality that was previously the domain of the GIS vendors, such as spatial analysis and mapping - I think that Microsoft should be able to provide core database functionality relatively quickly. It will be good for the industry for Oracle to have some more serious competition within the commercial database world, in regard to spatial. It really reinforces the trend that everyone has been talking about of geospatial data becoming mainstream, now that the top two commercial database vendors will both support spatial. The fact that Microsoft has an offering both in the space of the new disruptive online mapping offerings, with extensive packaged data (like Google and Microsoft) and in the database (like Oracle, which does not have an offering in the former space), opens up some interesting possibilities for them to offer solutions leveraging both aspects. I think that geospatial technology has much higher visibility at high levels in Microsoft than at Oracle (driven by Virtual Earth) - I talked more about this in an article at Geoplace. So Microsoft will need to follow through on the announcement, and has plenty to do to catch up with Oracle and the various open source spatial database offerings, but it's another important step in terms of geospatial really being a major area for Microsoft. I spent a couple of days this week at the GeoTec conference in Calgary, and it was a good event. Matt Ball said they had 1200 people registered - I don't think there were quite that many in the opening session, but it was good crowd still. Ed Parsons gave a good keynote on "once there were maps, now there is neogeography", focused on the impact of Google, Microsoft and Yahoo on the industry. I'll just mention a couple of snippets. He mentioned the momentum of open source data in Europe, something we haven't seen as much of in North America - Open Street Map is one of the main initiatives in this area. He also mentioned how geospatial standards had evolved from “proprietary standards” like DWG, DGN, Shape and Geodatabase, to “industry standards” like SOAP/UDDI, OGC WxS, and ISO 191xxx, to “lightweight standards” like GeoRSS, KML and REST. There's quite a lot of debate flying around at the moment about relative merits of KML and GML - I won't get into that at the moment, but may come back to it in a later post! 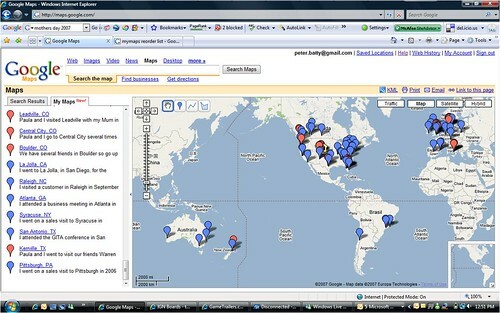 He also talked about Google MyMaps and highlighted that these maps are searchable via Google just like any other data. While he didn’t mention this specifically, any KML file online is now indexed by Google and can be searched for using both keywords and geospatial constraints. Later in the opening panel which followed the keynote, in which I participated, Sam Bacharach of OGC asked whether the panel thought that the more unstructured search approach of Google would be how people found spatial data in future, versus more structured approaches like those which had been worked on by the traditional geospatial community for the past ten years. There was some discussion around this, but overall I think the general opinion was probably yes, in most cases. There was also some discussion both on the panel and afterwards about concerns around metadata (in the OGC/ISO sense rather than the more generic KML sense), and being able to determine the quality of geospatial data. I think that as Google works with OGC on trying to harmonize KML with GML, it would be logical to allow the optional addition of OGC/ISO metadata into KML files, and then Google searches could use metadata when available to help determine where a given file should rank in response to a given search. In general there is a battle going on between more formalized approaches to being able to search for “structured” data, which generally fall under the umbrella of the “semantic web” initiatives advocated by Tim Berners Lee and others, and less structured approaches such as tagging (as used by flickr and many other “Web 2.0” sites), which are less theoretically elegant but much easier to get going in practice, and which may provide “good enough” results in many cases. Another strong theme at the conference was open source, which really seems to have strong momentum in Canada. When I was at Intergraph, I got many more inquiries from colleagues in Canada about the impact of open source geospatial solutions than from anywhere else. I enjoyed spending some time with fellow blogger Jason Birch, and attended a very interesting presentation he gave with Paul Spencer of DM Solutions about the work that City of Nanaimo is doing using open source Internet mapping solutions (there is a lot of new work in progress which isn't on their public site yet). I am seriously considering going to the FOSS4G conference, which is in Victoria in September - it sounds as though it should be pretty interesting (plus Vancouver Island is always a nice spot to visit!). I also attended a couple of interesting presentations on the use of Google Earth in more "traditional" geospatial applications, just reiterating the trend that we are seeing towards this. All in all it was a good conference. Stefan at Ogle Earth has a great post about his experiences in Whale Valley in Egypt with his Nokia N95, which was very interesting both from a technology and a more general perspective. The Nokia N95 is one of the main alternatives to the BlackBerry 8800, as a smart phone with built in GPS. He talks about several applications which I would like but haven't seen yet on the BlackBerry, as discussed in my previous post on this topic. One is Mobile GMaps, and the associated GMap-Track, which lets you track your location in near real time and upload it to a web site and display it on top of Google Maps. I downloaded this application, and while the mapping application ran, sadly it didn't recognize the internal GPS on my BlackBerry 8800, so I couldn't get at the cool features I was after. MGMaps uses a technology called Navizon for the positioning, which says it supports positioning using either GPS or triangulation of cellular and/or WiFi signals - but when I tried to configure this to use GPS, it wanted me to pair with an external GPS receiver, so no luck. It couldn't work out a position based on phone signals either - I'm in Calgary at the moment, am not sure if this is dependent on where in the world you are, I will try it when I get back to Denver. Hopefully Navizon and/or MGMaps will add GPS support for the BlackBerry soon. Stefan also talks about an application called ShoZu (at shozu.com), which lets you directly upload photos from the your cell phone (the Nokia N95 has a 5 megapixel camera, which is another advantage over the BlackBerry 8800, which has no camera) to flickr and other sites - and on phones with a GPS, it will geocode the photo so it can be displayed in the right location on a map. I have been talking about this possibility for a while, it's great to see that it is a reality now. As this type of technology becomes more universally available over the next few years, it will have great application in various ways - such as leveraging "the power of crowds" to get a near real time view of the aftermath of a natural or man-made emergency, which could be incredibly useful to emergency responders or utility repair crews. Finally, I'll just mention a couple more differences between the Nokia N95 and the BlackBerry 8800 - I was just comparing notes with Ed Parsons after our panel at the GeoTec conference today, he has the former and I have the latter. In addition to the features I already mentioned (camera and software), the Nokia supports WiFi connections, which the BlackBerry doesn't. Strengths of the BlackBerry are that it has a QWERTY keyboard, whereas the Nokia just has a regular phone keypad, so you need to use SMS-style text entry, so this is a plus for the BlackBerry if you want to do a lot of email or other typing. And of course the BlackBerry has its usual email, contacts and calendar software which are all very good. Ed said that he thinks that the nicest implementation of Google Maps Mobile currently is on the BlackBerry. And as I mentioned in my previous post, I am very impressed with the TeleNav navigation software which is available on the BlackBerry (it is supported on other platforms too, but from a quick Google search I couldn't find confirmation that it is available on the N95, so it may not be yet - but I'm not sure on that). The Nokia is quite a bit more expensive than the BlackBerry, in the US at least - currently around $800 on Amazon for an unlocked phone, while they currently have the BlackBerry on special offer for $99 with a service plan commitment (so not an apples to apples comparison, but nevertheless quite a difference). I paid $299 (with a service plan) for my BlackBerry recently, too bad :( !! The BlackBerry is slimmer than the Nokia but a little wider. So there are pros and cons to both, but the Nokia certainly has some nice additional features, with the camera, WiFi and some extra software capabilities (at the moment). Ed Parsons just posted about actionable location intelligence on mobile devices, and talked about recent enhancements Google has made to its mobile service in the UK. I think Google Maps Mobile is great, but I think it's still a good bit behind the Telenav software which runs on the BlackBerry (and also the navigation system in my Toyota Prius! - I posted about both of these previously - see also my short photo-based review of both of these on flickr). The two key features which Telenav provides which Google Maps Mobile doesn't yet are integration with the built in GPS (or any other location determination capability), and the ability to give directions which are safely usable while you're driving - i.e. a combination of spoken instructions and large turn graphics. A third feature which is helpful too is integration with contacts on the BlackBerry - the ability to type a contact's name and use their address as a destination (TeleNav has an advantage here in developing their application specifically for the BlackBerry, it is harder to do this if you're supporting a broader range of devices). Telenav - a really outstanding piece of software, I have been extremely impressed. The user interface has been very well thought out, it fully takes advantage of the built in GPS, either to give you a map of your current location or to do real time route guidance, and it has excellent spoken directions with clear turn graphics in either 2D or 3D styles. The business finder works very well both on categories and business names, and appears to be very up to date (I tried one example of a business which had moved about three months ago and it found the correct address). Its maps are pretty nice but it has no imagery capabilities, just street maps. There is a charge of $9.99 a month for this service. Google Maps Mobile - my previous favorite until I got Telenav. As noted above, the main things it is lacking are integration with the GPS and lack of spoken driving directions. However, the step by step directions capabilities are still very usable - especially if you have a copilot while driving, or if you are walking to your destination. But the map quality and performance are great, and it supports imagery which Telenav doesn't. The quality of the "Satellite View" images on the BlackBerry 8800 are really impressive. You can scroll around the map in all directions using the "pearl" trackball, which is another nice feature. There's also a "show traffic" option which is cool - if I'm not mistaken, this appeared on the mobile version before the standard Google Maps. It shows traffic congestion on freeways, with a green / yellow / red coloring scheme. This is a free offering. BlackBerry Maps - I haven't used this too much, to be honest. The maps look clunky compared to both of the previous two. It has pretty basic GPS integration - you can center the map on your current location. The directions capability is rudimentary - it gives you a text-based list of turns, or an overview map, there is not a step by step turn capability as with Google and Telenav. I just found that there is a "Send Location" capability, which is a cool idea - you can send your current location to someone via email, SMS or MMS, which includes a link with your latitude and longitude and the ability to display a map. However, what is less cool is that the link only works on a BlackBerry with BlackBerry Maps installed. But this is a great idea for someone to implement in a more generic way. This is also free software. Spot for BlackBerry - frankly I have been disappointed in this, it doesn't seem ready for prime time. It touts some interesting features, like the ability to import and export GPX files. I was interested in this for geotagging photos using RoboGeo (which just cross-references to a GPS tracklog based on time, and so records the location of all the photos you have taken). However, after quite a lot of messing around, I found that while Spot apparently records a tracklog (you can see this on the map, if you look hard), the export GPX capability doesn't export this, it only exports waypoints which you have specifically logged. It has the ability to access any WMS map server, which is interesting, but the default maps it is set up with are not nearly as nice as the other three. I found the user interface very clunky compared to the other three. With some work, this could have some good capabilities, but it's not quite there yet. This costs $49 (a one time charge with no subscription). So I'm still looking for some software for the BlackBerry 8800 which will be able to record a GPS tracklog of where I've been (just running in the background while I'm using other capabilities), and be able to export that to my PC. I'd also like something which can report my location regularly back to a server (TeleNav has a workforce management solution which includes this capability, but it's a bit more heavyweight than I need). This may be my opportunity to brush up on my Java coding :) ! Adena at All Points Blog references a story about how cars depreciate faster if they have built in navigation systems. Which on the surface of it is not good news for those of us who always buy cars with cool built in navigation systems :) !! However, when you think about it, this is just a logical consequence of the fact that cars are becoming more high tech devices. When you buy a digital camera, you can guarantee that within a few months there will be something better and cheaper on the market - you don't expect to have a good resale value on it in 3 years time. Over the next few years we will see a lot more technology coming into cars, including much more in the way of online information systems - real time traffic information, gas prices, etc - so I think the trend of cars depreciating more rapidly will continue. And I don't think that this necessarily indicates that portable systems will overwhelm factory installed systems - the latter tend to have various features that the former don't, for example they mute music playing in the car when they need to speak directions, and many of them integrate with inertial systems in the car so that they can continue to work when a GPS signal is not available (for example when going through a tunnel). However, I think that car manufacturers will need to work on making their software systems (not just for navigation) more easily upgradeable - though again I think this will be a logical step as we move to a situation where most cars have wireless connectivity. Finally, as Adena mentions, there is a quote in the article that navigation systems are now being "sold everywhere. You have Bed Bath & Beyond selling portable navigation these days. It's bizarre." I guess navigation systems would fall into the "Beyond" category :) ?! A friend sent me a link to this Visual Complexity site, which I thought was very cool. For some time I have been interested in the possibilities of leveraging video game technology in the geospatial world. Back in 2002, I attended a conference conference where one of the main themes was how commercial video game technology could be used as a basis for military training and simulation software - the game market had become so big that its technology had moved ahead of what more specialized companies could do for the military. This is an example of a more general trend towards consumer-led computing (a term first coined by Garter) - whereas in the past, new computing ideas would generally develop first in the business world and later move into the consumer area, in many cases it is now the other way round. We are certainly seeing this in the geospatial world with the impact of Google, Microsoft and others. I will be speaking on the opening panel at the upcoming GeoTec conference in Calgary on May 15 (for a 7MB PDF program click here). There is good "ex-CTO" representation on the panel, with myself and Ed Parsons, ex-CTO of Ordnance Survey, who of course is now at Google, and we are joined by Joe Berry from University of Denver and Elizabeth Cannon from University of Calgary. With that group I think it should be an interesting panel. I look forward to catching up with some of my Canadian friends, and will be sure to be seen having a beer with Ed so that Glenn from GISuser has additional food for his theories on where I will end up next :) ! In an earlier post I mentioned in passing that Google Maps had the annoying feature that it wouldn't display more than 50 markers on a map, instead it would split them into arbitrary "pages" of 50 markers each. This applied either to displaying a KML map, or to using MyMaps (which presumably amounts to the same thing). However, I just noticed that this has changed - the map I created at Google MyMaps showing my Intergraph travels, which has eighty-something markers and was previously displayed on two pages, is now displayed in a single map with no pages (without me having changed anything). It's not obvious whether they have done anything clever to handle larger numbers of markers, like generalizing multiple overlapping markers to a single marker when zoomed out, or whether they have just increased the number of markers which are displayed before a new page is generated (I suspect probably the latter, but haven't had a chance to play around yet to see if there is a new higher limit). Another obvious enhancement request is to be able to reorder the list of items shown on the left of the map - apparently this can't be done at the moment, though plenty of people are requesting the feature. This can be done in Google Earth and resaved as KML, but currently there is no way of importing a KML file into MyMaps - though this seems like another obvious enhancement so I can't imagine it will be long before this is available. I have been dabbling with Plazes for the past few weeks, which is a location-based networking site. The little flash-based map in the right hand column of this blog showing where I am comes from them. The site has enough cool features that I've stuck with it, but to be honest I've had quite a lot of frustrations with it too. The cool features for me are the aforementioned flash widget, and the ability to update your location in real time using SMS text messages - this feature is well thought out and seems to work very well. However, I find the layout of the web site very confusing and hard to navigate, and missing some obvious functionality, like the ability to update your location (with the same capabilities that you have via SMS). You can't edit places you've been, or enter where you were after the fact. They have a downloadable tool called the Plazer which locates you based on connection to a WiFi network, but I still haven't managed to get that to work, on two different laptops so far (one running XP and one Vista). Some of you might have already heard through the grapevine and now we will make it official: Plazes will be bringing out a new version later next month (May)! The newly designed Plazes will come along with an array of new features complete with a new, user-friendly interface. One of the many new features that will be premiered is the setting of past and future Plazes. Remember that backpacking trip through India that you didn't have a chance to document on Plazes? Well, with the new version you will be able to document the Plazes you have been to and share this information complete with pictures and comments with your friends. Upon popular demand, the new version will also let you set Plazes you plan to visit in the future. So if you are planning a business trip to Asia next month, with the new version of Plazes you will be able to coordinate meetups in advance. There are still many more new features to look forward to. Stay tuned for more information about the new Plazes in next week's newsletter! I look forward to seeing these updates soon. Now what I really want is integration with the GPS on my BlackBerry 8800! !